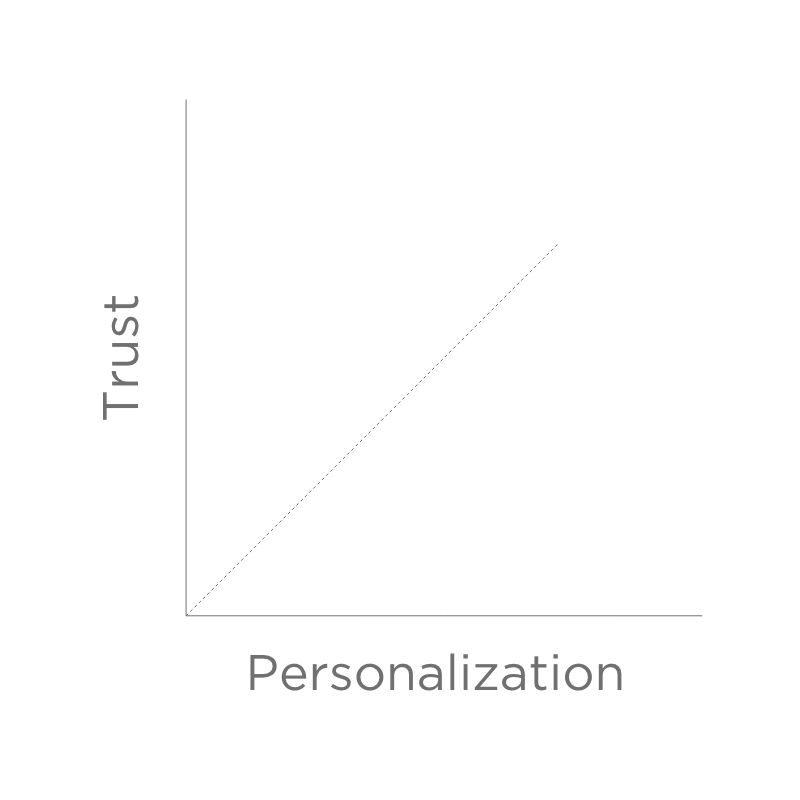 The correlation between a prospective customer’s trust and the personalization of your experience offering shapes behaviors, impressions and outcomes related to exchange. Let’s look at a model* to help us understand its significance for enrollment marketers. On the y axis is trust. Trust, for purposes of this model, is defined as the degree to which a customer anticipates your respect and confidentiality of shared information with your brand throughout their interactions with you. Consider Amazon. If you are an Amazon customer, you likely have given the brand a great deal of information about yourself. This includes, but isn’t limited to: the products you searched, products you purchased, where those products were delivered and all of the other personal details necessary for a financial transaction including credit card account numbers. Because you’ve had an exchange with Amazon, you now trust them at some level on the y axis. 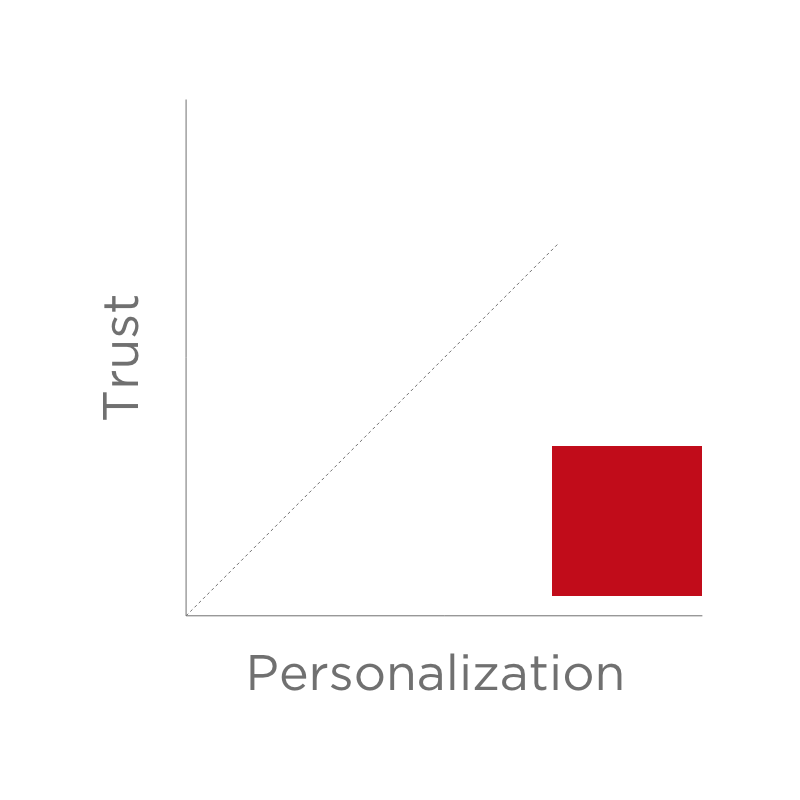 Personalization falls on the x axis, defined by the amount of personalized content that a brand delivers in the form of marketing. Revisiting the Amazon example, you may see behavioral retargeting ads in your browser featuring products you have searched for on Amazon that tracked you to another site via a cookie, pixel or tag. 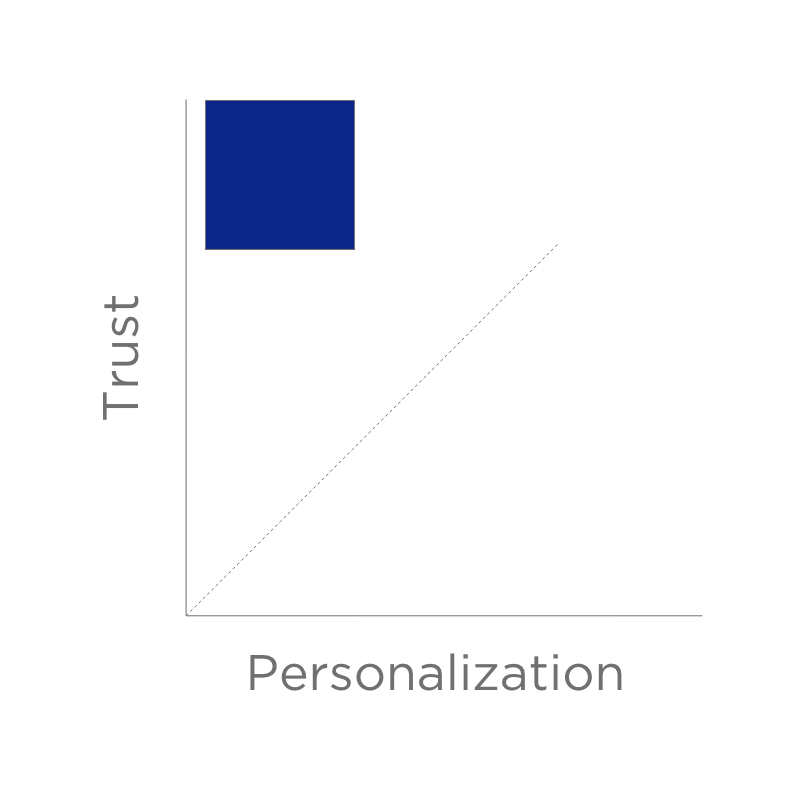 This zone, identified in blue, represents high trust in an experience that isn’t highly personalized. With most transactions, this is where you begin. You need to build trust by providing value without violating confidence by presenting too much gained data about the customer. To move up the y axis, you must provide value. In this early stage, the customer is demonstrating trust (confidence in the risk they are taking) by sharing personal information. You reward this trust with a response that respects the degree of information you’ve been given, even if you know more by other means. By doing so, you earn greater trust from the customer. Trust is earned from listening well and responding to customer need. The prospect doesn’t remember providing (or granting permission to use) their data. The prospect provided their data, but sufficient value has not yet been delivered to earn trust. The prospect provided their data, but the content is irrelevant. 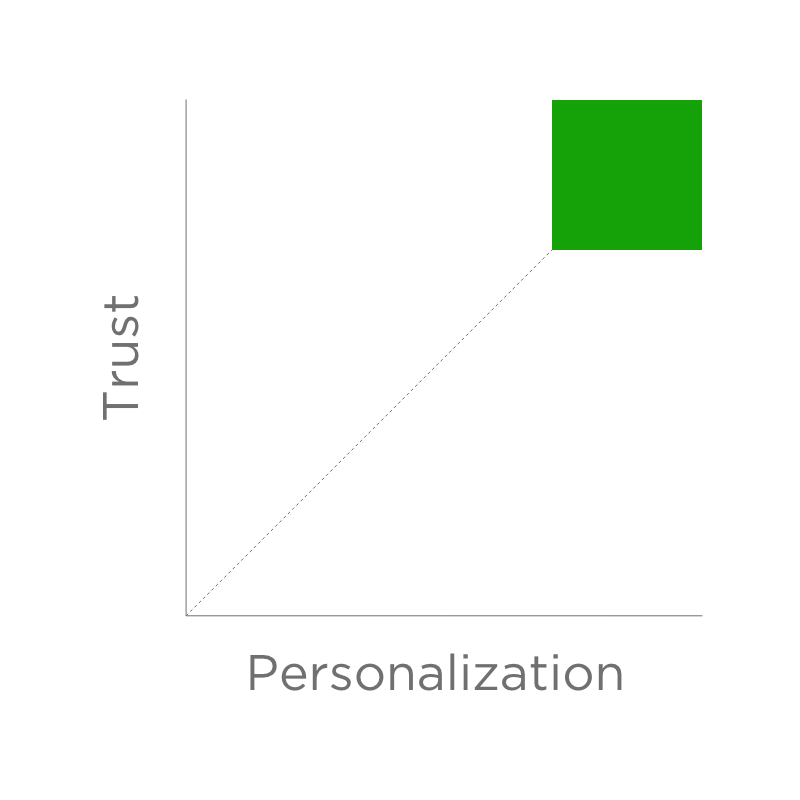 This zone, identified in green, represents an ideal zone: The brand has delivered high value and the content provided is highly personalized. Other than the obvious reasons, the distinction between this and zone one is a better environment for conversion because the brand has presented specifically what the prospect wants in a trustworthy way. This is where Amazon grades. If we agree that the definition of marketing is simply exchange; necessitating two parties each having something of equal or greater value to the other, in proximity (virtually or physically), then we can see the contrast between low and high personalization. High value experiences without personalization can thwart a purchase due to the friction created by requiring the customer to provide more information (or repeat the same information given you previously) or, identify what they’d actually like to buy from you. Whether they use this matrix or not, enrollment marketers face the challenge of providing value while they are creating an environment for exchange with prospective students and their influencers. We hear often that marketers are leery of entering the “creepy zone” given the extraordinary amount of information they possess about prospective students. At the same time, building value without personalization often means the institution hasn’t put themselves in position to “ask” for a commitment. Here are three ways to apply the matrix to your communication strategy. Provide value early. At the beginning of the recruitment process create value in two primary ways. First, equip the prospect with the tools for going about college search (who better to provide insight about the process than those who practice it?). Provide helpful answers to prospect questions such as How you do you choose a college? What should you do first? What should you avoid doing?Providing this type of value is essential to the prospect and serves as a positioning tactic. Second, clearly define and articulate your institution’s market position to help prospects evaluate your differences compared to other options. Use personalization with intent. Reflecting interests from a student shows that you have listened and acknowledge the inputs. Your thoughtful response builds trust that you will respect information given you. Remember: Personalization without trust can be interpreted as being creepy, but trust with value (connecting a students’ provided interest to your offerings) should be interpreted as politeness. More to the point, if you’ve collected data on a student and do notpersonalize their experiences in the form of campus visit, variable data, communication preferences, progressive profiling, why ask for it? By asking for information, you are creating expectation that you will use it wisely to continue a conversation with the prospect. Apply the CCT framework. Using the matrix as a foundation for the type of communication you produce, apply the CCT (Content, Channel and Timing) framework to your efforts. What is the Content that you want to present? What Channel will the message be distributed in? And finally, when (Timing) will you send this message? Given what you know about the matrix, I urge you to reorder the CCT framework to suit your needs. For instance, when you are in value-building mode, likely early in the process, seek data from customers to inform the type of content you deliver. Late in the process, when you have a great deal of data and trust built, you can explore different channels that provide for more personalized, automated experiences. *The trust-personalization model was presented by Clarence Lee, Assistant Professor at Johnson Graduate School of Management at Cornell University. Adaptations to higher education enrollment marketing are mine. Fight summer melt with better customer experiences.